This 45 year old patient had rheumatoid arthritis which required intermittent treatment with prednisone. This had caused her to gain and lose weight over the past few years. This had accelerated her aging changes. 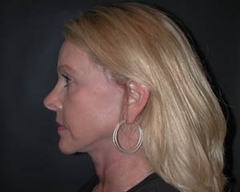 With her rheumatoid arthritis in remission she decided to proceed complete facial rejuvenation with face lift, brow lift, fat grafting to the face, and a deep peel to the skin of the lower eyelids and around the round the mouth with Croton oil. 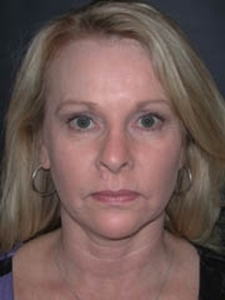 The face and neck lift was performed followed by the brow lift. 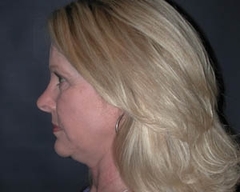 The fat was taken from her abdomen and then used to add volume to the tear troughs, cheeks, and around the mouth. Finally a deep peel with Croton oil was used to tighten the skin of the lower eyelids and the skin around the mouth. All the incisions healed well despite her history of being on prednisone. Her photographs were taken at seven weeks. She still has some swelling in the lower eyelids. She's very happy with the early results.